By Prof Michel Chossudovsky. Republished from Global Research. In the days following the Ukraine coup d’Etat of February 23, leading to the ousting of a duly elected president, Wall Street and the IMF–in liaison with the US Treasury and the European Commission in Brussels– had already set the stage for the outright takeover of Ukraine’s monetary system. The EuroMaidan protests leading up to “regime change” and the formation of an interim government were followed by purges within key ministries and government bodies. The Governor of the National Bank of Ukraine (NBU) Ihor Sorkin was fired on February 25th and replaced by a new governor: Stepan Kubiv. Stepan Kubiv (right) is a member of Parliament of the Rightist Batkivshchyna “Fatherland” faction in the Rada led by the acting Prime Minister Arseny Yatsenyuk (founded by Yulia Tymoshenko in March 1999). He previously headed Kredbank, a Ukrainian financial institution largely owned by EU capital, with some 130 branches throughout Ukraine. Ukraine Central Bank Promises Liquidity To Local Banks, With One Condition, Zero Hedge, February 27, 2014). Kubic is no ordinary bank executive. He was one of the first field “commandants” of the EuroMaidan riots alongside Andriy Parubiy co-founder of the Neo-Nazi Social-National Party of Ukraine (subsequently renamed Svoboda) and Dimitry Yarosh, leader of the Right Sector Brown Shirts, which now has the status of a political party. 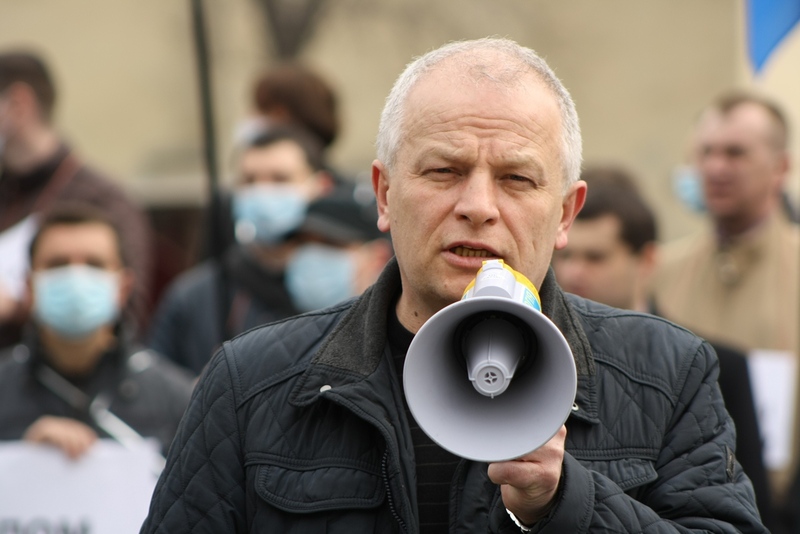 Kubiv was in the Maidan square addressing protesters on February 18, at the very moment when armed Right Sector thugs under the helm of Dmitry Yarosh were raiding the parliament building. 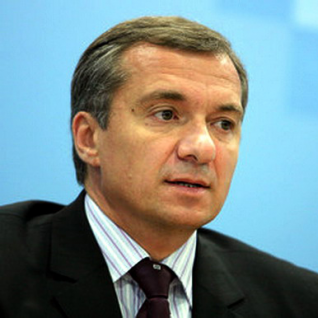 A few days later, upon the establishment of the interim government, Stepan Kubiv was put in charge of negotiations with Wall Street and the IMF. Minister of Finance Aleksandr Shlapak works in close liaison with Pavlo Sheremeto, the newly appointed Minister of Economic Development and Trade, who upon his appointment called for “deregulation, fully fledged and across the board”, requiring –as demanded in previous negotiations by the IMF– the outright elimination of subsidies on fuel, energy and basic food staples. Another key appointment is that of Ihor Shvaika [right], a member of the Neo-Nazi Svoboda Party, to the position of Minister of Agrarian Policy and Food. Headed by an avowed follower of World War II Nazi collaborator Stepan Bandera [see image below], this ministry not only oversees the agricultural sector, it also decides on issues pertaining to subsidies and the prices of basic food staples. The new Cabinet has stated that the country is prepared for socially “painful” but necessary reforms. In December 2013, a 20 billion dollar deal with the IMF had already been contemplated alongside the controversial EU-Ukraine Association Agreement. Yanukovych decided to turn it down. One of the requirements of the IMF was that “household subsidies for gas be reduced once again by 50%”. Shortly after his instatement, the interim (puppet) prime minister Arseny Yatsenyuk casually dismissed the need to negotiate with the IMF. Prior to the conduct of negotiations pertaining to a draft agreement, Yatsenyuk had already called for an unconditional acceptance of the IMF package: “We have no other choice but to accept the IMF offer”. The actual timeframe for the implementation of the IMF’s “shock therapy” has not yet been firmly established. In all likelihood, the regime will attempt to delay the more ruthless social impacts of the macroeconomic reforms until after the May 25 presidential elections (assuming that these elections will take place). The text of the IMF agreement is likely to be detailed and specific, particularly with regard to State assets earmarked for privatization. Henry Kissinger and Condoleeza Rice, according to Bloomberg are among key individuals in the US who are acting (in a non-official capacity) in tandem with the IMF, the Kiev government, in consultation with the White House and the US Congress. The above statement is wrought with hypocrisy. In practice, the IMF does not wield “sound economic governance” nor does it protect the vulnerable. It impoverishes entire populations, while providing “prosperity” to a small corrupt and subservient political and economic elite. IMF “economic medicine” while contributing to the enrichment of a social minority, invariably triggers economic instability and mass poverty, while providing a “social safety net” to the external creditors. To sell its reform package, the IMF relies on media propaganda as well as persistent statements by “economic experts” and financial analysts which provide authority to the IMF’s macroeconomic reforms. The unspoken objective behind IMF interventionism is to destabilize sovereign governments and literally break up entire national economies. This is achieved through the manipulation of key macroeconomic policy instruments as well as the outright rigging of financial markets, including the foreign exchange market. To reach its unspoken goals, the IMF-World Bank –often in consultation with the US Treasury and the State Department–, will exert control over key appointments including the Minister of Finance, the Central Bank governor as well as senior officials in charge of the country’s privatization program. These key appointments will require the (unofficial) approval of the “Washington Consensus” prior to the conduct of negotiations pertaining to a multibillion IMF bailout agreement. 1) to facilitate the collection of debt servicing obligations, while ensuring that the country remains indebted and under the control of its external creditors. 5) to implement the privatization of key sectors of the economy through the sale of public assets to foreign corporations. 6) to facilitate the takeover by foreign capital (including mergers and acquisitions) of selected privately owned Ukrainian corporations. 7) to ensure the deregulation of the foreign exchange market. While the privatization program ensures the transfer of State assets into the hands of foreign investors, the IMF program also includes provisions geared towards the destabilization of the country’s privately owned business conglomerates. A concurrent “break up” plan entitled “spin-off” as well as a “bankruptcy program” are often implemented with a view to triggering the liquidation, closing down or restructuring of a large number of nationally owned private and public enterprises. The “spin off” procedure –which was imposed on South Korea under the December 1997 IMF bailout agreement– required the break up of several of Korea’s powerful chaebols (business conglomerates) into smaller corporations, many of which were then taken over by US, EU and Japanese capital.. Sizeable banking interests as well highly profitable components of Korea’s high tech industrial base were transferred or sold off at rock bottom prices to Western capital. (Michel Chossudovsky, The Globalization of Poverty and the New World Order, Global Research, Montreal, 2003, Chapter 22). These staged bankruptcy programs ultimately seek to destroy national capitalism. In the case of Ukraine, they would selectively target the business interests of the oligarchs, opening the door for the takeover of a sizeable portion of Ukraine’s private sector by EU and US corporations. The conditionalities contained in the IMF agreement would be coordinated with those contained in the controversial EU-Ukraine Association agreement, which the Yanukovych government refused to sign. Ukraine’s external debt is of the order of $140 billion. In consultations with the US Treasury and the EU, the IMF aid package is to be of the order of 15 billion dollars. Ukraine’s outstanding short-term debt is of the order of $65 billion, more than four times the amount promised by the IMF. The Central Bank’s foreign currency reserves have literally dried up. In February, according to the NUB, Ukraine’s foreign-currency reserves were of the order of a meagre US$13.7 billion, its Special Drawing Rights with the IMF were of the order of US$16.1 million, its gold reserves US$1.81 billion. There were unconfirmed reports that Ukraine’s gold had been confiscated and airlifted to New York, for “safe-keeping” under the custody of the New York Federal Reserve Bank. Under the bailout, the IMF –acting on behalf of Ukraine’s US and EU creditors– lends money to Ukraine which is already earmarked for debt repayment. The money is transferred to the creditors. The loan is “fictitious money”. Not one dollar of this money will enter Ukraine. The package is not intended to support economic growth. Quite the opposite: Its main purpose is to collect the outstanding short term debt, while precipitating the destabilization of Ukraine’s economy and financial system. The fundamental principle of usury is that the creditor comes to the rescue of the debtor: “I cannot pay my debts, No problem my son, I will lend you the money and with the money I lend you, you will pay me back”. What are the “benefits” of an IMF package to Ukraine? 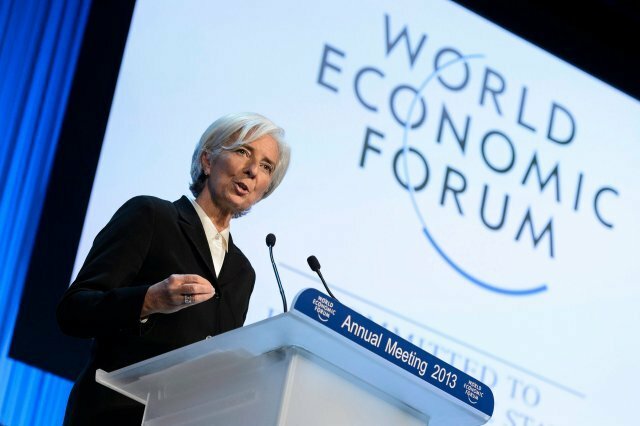 According to IMF’s managing director Christine Lagarde the bailout is intended to address the issue of poverty and social inequality. In actuality what it does is to increase the levels of indebtedness, while essentially handing over the reins of macro-economic reform and monetary policy to the Bretton Woods Institutions, acting on behalf of Wall Street. The bailout agreement will include the imposition of drastic austerity measures which in all likelihood will trigger further social chaos and economic dislocation. It’s called “policy based lending”, namely the granting of money earmarked to reimburse the creditors, in exchange for the IMF’s “bitter economic medicine” in the form of a menu of neoliberal policy reforms. “Short-term pain for long term gain” is the motto of the Washington based Bretton Woods institutions. Loan “conditionalities” will be imposed –including drastic austerity measures– -which will serve to impoverish the Ukrainian population beyond bounds in a country which has been under IMF ministrations for more than 20 years. While the Maidan movement was manipulated, tens of thousands of people protested they wanted a new life, because their standard of living had collapsed as a result of the neoliberal policies applied by successive governments, including that of president Yanukovych. Little did they realize that the protest movement supported by Wall Street, the US State Department and the National Endowment for Democracy (NED) was meant to usher in a new phase of economic and social destruction. 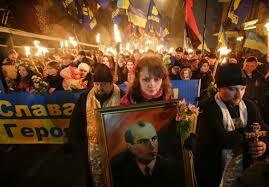 In 1994 under the presidency of Leonid Kuchma, an IMF package was imposed on Ukraine. Viktor Yushchenko –who later became president following the 2004 Colored Revolution– had been appointed head of the newly-formed National Bank of Ukraine (NBU). Yushchenko was praised by the Western financial media as a “daring reformer”; he was among the main architects of the IMF’s 1994 reforms which served to destabilize Ukraine’s national economy. 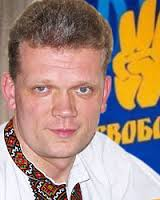 When he ran in the 2004 elections against Yanukovych, he was supported by various foundations including the National Endowment for Democracy (NED). He was Wall Street’s preferred candidate. Ukraines’ 1994 IMF package was finalized behind closed doors at the Madrid 50 years anniversary Summit of the Bretton Woods institutions. It required the Ukrainian government to abandon State controls over the exchange rate leading to an massive collapse of the currency. Yushchenko played a key role in negotiating and implementing the 1994 agreement as well as creating a new Ukrainian national currency, which resulted in a dramatic plunge in real wages:. Ironically, the IMF sponsored program was intended to alleviate inflationary pressures: it consisted in imposing “dollarised” prices on an impoverished population with earnings below ten dollars a month. Combined with the abrupt hikes in fuel and energy prices, the lifting of subsidies and the freeze on credit contributed to destroying industry (both public and private) and undermining Ukraine’s breadbasket economy. The IMF-World Bank had destroyed Ukraine’s ‘bread basket”. By 1998, the deregulation of the grain market, the hikes in the price of fuel and the liberalisation of trade resulted in a decline in the production of grain by 45 percent in relation to its 1986-90 level. The collapse in livestock production, poultry and dairy products was even more dramatic. (See http://www.imf.org/external/pubs/ft/scr/2003/cr03174.pdf). The cumulative decline in GDP resulting from the IMF sponsored reforms was in excess of 60 percent from 1992 to 1995. What the report fails to mention is that the Bretton Woods institutions –through a process of economic engineering– played a central role in precipitating the post-Soviet collapse of the Ukrainian economy. The dramatic breakdown of Ukraine’s social programs bears the fingerprints of the IMF-World Bank austerity measures which included the deliberate underfunding and dismantling of the Soviet era health care system. “Depressed farm incomes” are not “the cause” they are the “consequence” of the IMF-World Bank Structural Adjustment Program. In 1994, farm incomes had declined by the order of 80% in relation to 1991, following the October 1994 IMF program engineered by then NUB governor Viktor Yushchenko. Immediately following the 1994 IMF reform package, the World Bank implemented (in 1995) a private sector “seed project” based on “the liberalization of seed pricing, marketing, and trade”. The prices of farm inputs increased dramatically leading to a string of agricultural bankruptcies. Projects : Agricultural Seed Development Project | The World Bank, Washington DC, 1995. While the conditions prevailing in Ukraine today are markedly different to those applied in the 1990s, it should be understood that the imposition of a new wave of macro-economic reforms (under strict IMF policy conditionalities) will serve to impoverish a population which has already been impoverished. In other words, the IMF’s 2014 “Shock and Awe” constitutes the “final blow” in a sequence of IMF interventions spreading over a period of more than 20 years, which have contributed to destabilizing the national economy and impoverishing Ukraine’s population. The Kiev government has announced that the IMF requires a 20% cut in Ukraine`s national budget, implying drastic cuts in social programs, coupled with reductions in the wages of public employees, privatisation and the sale of state assets. The IMF has also called for a “phase out” of energy subsidies, and the deregulation of the foreign exchange markets. With unmanageable debts, the IMF will also impose the sell off and privatisation of major public assets as well as the takeover of the national banking sector. Given the absence of a real government in Kiev, Ukraine’s political handlers in the Ministry of Finance and the NUB will obey the diktats of Wall Street: The IMF structural adjustment loan agreement for Ukraine will be devastating in its social and economic impacts. Pointing to “market distorted energy subsidies”, price deregulation has been a longstanding demand from both IMF-World Bank. The price of energy had been kept relatively low during the Yanukovych government largely as a result of the bilateral agreement with Russia, which provided Ukraine with low cost gas in exchange for Naval base lease in Sebastopol. That agreement is now null and void. It is also worth noting that the government of Crimea has announced that it would take over ownership of all Ukrainian state companies in Crimea, including the Black Sea natural gas fields. The Kiev interim government has intimated that Ukraine’s retail gas prices would have to rise by 40% “as part of economic reforms needed to unlock loans from the International Monetary Fund”. This announcement fails to address the mechanics of full fledged deregulation which under present circumstances could lead to increases in energy prices in excess of 100 percent. It is worth recalling, in this regard, that Peru in August 1991 had set the stage for “shock treatment” increases in energy prices when gasoline prices in Lima shot up overnight by 2978% (a 30 fold increase). In 1994 as part of the agreement between the IMF and Leonid Kuchma, the price of electricity flew up over night by 900 percent. One of the central components of IMF intervention is the deregulation of the foreign exchange market. In addition to massive expenditure cuts, the IMF program requires “enhanced exchange rate flexibility” namely the removal of all foreign exchange controls. Ukraine: Staff Report for the 2012 Article IV Consultation, See also http://www.imf.org/external/pubs/ft/scr/2012/cr12315.pdf. Since the outset of the Maidan protest movement in December 2013, foreign exchange controls were instated with a view to supporting the hyrvnia and stemming the massive outflow of capital. The IMF sponsored bailout will literally ransack the foreign currency reserves held by the National Bank of Ukraine (NBU). Enhanced exchange rate flexibility under IMF guidance has been endorsed by the new NBU governor Stepan Kubic. Without virtually no forex reserves, exchange rate flexibility is financial suicide: it opens the door to speculative short-selling transactions (modelled on the 1997 Asian crisis) directed against the Ukraine’s currency, the hrynia. Institutional speculators, which include major Wall Street and European Banks as well as hedge funds have already positioned themselves. Manipulation in the forex markets is undertaken through derivative trade. Major financial institutions will have detailed inside information with regard to Central Bank policies which will enable them to rig the forex market. Under a flexible exchange rate system, the Central Bank does not impose restrictions on forex transactions. The Central Bank can however decide –under advice from the IMF– to counter the speculative onslaught in the forex market, with a view to maintaining the parity of the Ukrainian hryvnia. Without the use of exchange controls, this line of action requires Ukraine’s central bank (in the absence of forex reserves) to prop up an ailing currency with borrowed money, thereby contributing to exacerbating the debt crisis. It is worth recalling in this regard that Brazil in November 1998 had received a precautionary bailout loan from the IMF of the order of 40 billion dollars. One of the conditions of the loan agreement, however, was the complete deregulation of the forex market. This loan was intended to assist the Central Banking in maintaining the parity of the Brazilian real. In practice it spearheaded Brazil into a financial crash in February 1999. The Brazilian government had accepted the conditionalities. Marred by capital flight of the order of 400 million dollars a day, the money granted under the IMF loan –which was intended to prop up Brazil’s central banks reserves– was plundered in a matter of months. The IMF loan agreement to Brasilia enabled the institutional speculators to buy time. Most of the money under the IMF loan was appropriated in the form of speculative gains accruing to major financial institutions. With regard to Ukraine, enhanced exchange flexibility spells disaster. Contrary to Brazil, the Central Bank has no forex reserves which would enable it to defend its currency. Where would the NBU get the borrowed forex reserves? Most of the funds under the proposed IMF-EU rescue package are already earmarked and could be used to effectively defend the hrynia against “short-selling” speculative attacks in the currency markets. The most likely scenario is that the hrynia will experience a major decline leading to significant hikes in the prices of essential commodities, including food, fuel and transportation. Were the Central Bank able to use borrowed reserves to prop up the hrynia, this borrowed money would be swiftly reappropriated, handed over to currency speculators on a silver platter. This scenario of propping up the national currency using borrowed forex reserves (i.e. Brazil in 1998-99) would, however, contribute in the short-term to staving off an immediate collapse of the standard. This procedure provides “extra time” to the speculators, who are busy plundering the Central Bank’s (borrowed) currency reserves. It also enables the interim government to postpone the worst impacts of the IMF’s “enhanced exchange rate flexibility” to a later date. When the borrowed hard currency reserves of the Central Bank run out –i.e. in the immediate aftermath of the May 25 presidential elections– the value of hrynia will plunge on the forex market, which in turn will trigger a dramatic collapse in the standard of living. Coupled with the demise of bilateral economic relations with Russia pertaining to the supply of natural gas to Ukraine, energy prices are also slated to increase dramatically. 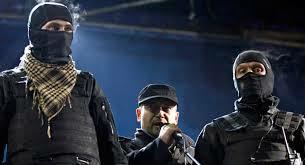 With Svoboda and Right Sector political appointees in charge of national security and the armed forces, a real grassroots protest movement directed against the IMF’s deadly macroeconomic reforms, will in all likelihood be brutally repressed by the Right Sector’s “brown shirts” and the National Guard paramilitary led by Dmitri Yarosh [left image, center with the microphone], on behalf of Wall Street and the Washington consensus. In recent developments, Right Sector Dmitry Yaroch has declared his candidacy in the upcoming presidential elections. (Popular support for the Yaroch is less than 2%). Meanwhile, Ukraine’s State prosecutor who also belongs to the Neo-Nazi faction, has implemented procedures which prevent the holding of public rallies and protests directed against the interim government. Posted in CORPORADOES, COVERT OPS & INTELLIGENCE, Eastern Europe, Europe Matters, GUEST AUTHOR, LIES AND PROPAGANDA, Russia, SCUM WATCH.